This smoothie is dedicated to an old colleague and friend, Todd, aka T-Mac. To fuel our active lifestyles we need plenty of nutrient dense foods and nutritionally loaded smoothies. This smoothie was designed to replenish your body after an intense workout or for a complete breakfast. Three of my favorite smoothie ingredients are found in this recipe. Gelatin, which is basically pure protein, and great for your joints, ligaments, skin, hair, and nails. Chia seeds, which contain omega-3 fatty acids, fiber, and whose mucilaginous properties support a healthy intestinal track and regular bowel movements. And coconut oil, perhaps my favorite ingredient of all. Coconut oil contains the healthy medium chain fats that your body converts almost directly into energy. 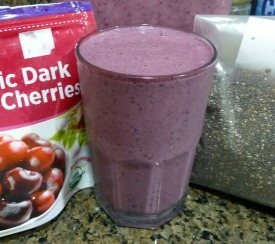 Throw in some antioxidant, vitamin, and mineral rich berries and you’ve got one delicious and highly nutritious smoothie. I hope everyone, especially Todd, enjoys this smoothie as much as me! Let me know you tried the T-Mac smoothie by leaving a comment below. Happy Blending! Firstly, i love your smoothies. The turmeric has become a morning ritual for me now. Well. Nealy. I just cant find coconut oil. I saw a diff smoothie page where you gave a link to where you buy it by the gallon, but they only deliver to north america. I’m in london, UK. My local health store only had it in a kind of vegan butter which had other ingredients. What exactly should i look for and do you know anywhere in the UK that would help me? I see that Mountain Rose Herbs only ships within the U.S. However, the other retailer I recommend, Tropical Traditions, has international shipping. I couldn’t confirm they deliver to the UK, but I’m betting they do if they ship internationally. Their Gold Label Virgin Coconut Oil is excellent. Avoid that vegan butter. Thanks for getting back to me. Unfortunately their cheapest shipping option to the uk is more than the actual gallon of oil! I’ll source out a local supplier and let you know. I have been making a smoothie every morning since I stumbled upon your recipes, and started getting your newsletter. Thank you for all the valuable information, and your delicious smoothie recipes. I want to start adding bovine gelatin for protein. You recommended Jensen’s? My question is for the cold smoothie recipes you have with this gelatin do you have a problem with it not dissolving? You don’t mention dissolving in warm water in the instructions for the smoothies. I would rather not have to dissolve in warm liquid as I want my smoothie cold. I’ve never had a problem with gelatin dissolving, Terry, but others have. Try adding it to your cold smoothies and see how it blends. If it clumps, blend all the ingredients in your smoothie first, then add gelatin and do a final blend.